Bucket shop is a brokerage firm that “books" (i.e., takes the opposite side of) retail customer orders without actually having them executed on an exchange. These brokerages are also often called boiler rooms. The term is a defined term under the criminal law of many states in the United States which make it a crime to operate a bucket shop. Typically the criminal law definition refers to an operation in which the customer is sold what is supposed to be a derivative interest in a security or commodity future, but there is no transaction made on any exchange. The transaction goes 'in the bucket' and is never executed. Without an actual underlying transaction, the customer is betting against the bucket shop operator, not participating in the market. Alternatively, the bucket shop operator "literally 'plays the bank,' as in a gambling house, against the customer." Operating a bucket shop in the United States would also likely involve violations of several provisions of federal securities or commodity futures laws. A person who engages in the practice is referred to as a bucketeer and the practice is sometimes referred to as bucketeering. Bucket shops specializing in stocks and commodity futures flourished in the United States from the 1870s until the 1920s. Edwin Lefèvre, who is believed to have been writing on behalf of Jesse Lauriston Livermore, describes the operations of bucket shops in the 1890s in detail. In the United States, the traditional pseudo-brokerage bucket shops came under increasing legal assault in the early 1900s, and were effectively eliminated before the 1920s. However, the term came to apply to other types of scams, some of which are still practiced. They were typically small store front operations that catered to the small investor, where speculators could bet on price fluctuations during market hours. However, no actual shares were bought or sold: all trading was between the bucket shop and its clients. The bucket shop made its profit from commissions, and also profited when share prices went against the client. The highly leveraged use of margins theoretically gave the speculators equally large upside potential. However, if a bucket shop held a large position on a stock, it might sell the stock on the real stock exchange, causing the price on the ticker tape to momentarily move down enough to wipe out its client's margins, and the bucket shop could take 100% of their investments. The curse of this sort of business is that it attracts men and women of very small means, often office boys and the like. It is one of the worst forms of stock gambling known and has done untold injury. The majority of "bucket shops" will advertise that stock can be actually delivered, but as nobody calls for delivery, except in rare cases, they can afford to purchase the stock through genuine brokers to fill the demand of such rare occasions. "Bucket shops" thrive best on a declining market, for it is natural for the average person to buy stocks in anticipation of their advance in value; or, in other words, the majority of customers wager that stocks will go up. Therefore, a falling market causes the "bucket shop" to win more of its wagers than a rising market. The magnitude and power of this unwholesome business, centering in New York, is emphasized by the knowledge that at times the daily transactions are almost as large as that reported on the New York Exchange itself. The impression is growing that a large percentage of this business is in the control of a few unscrupulous men commanding enormous financial resources. Under their management the tentacles of this business are reaching out over the country in the shape of branch offices, from which points orders are received at the common centre. Suppose, for example, one of these heavily financially backed concerns finds that it has "orders to buy" a very large number of shares of a given stock. Technically, they are "short" of that stock. It is perfectly feasible for them to go into the market and offer a large block of the same stock for sale, and break the price sufficiently to wipe out all the margins on orders in hand. Stratagems of this kind must be done by the "bucket shop" indirectly, as legitimate stock exchanges do not countenance members accepting orders directly from "bucket shops." Bucket shops have been defrauding investors using puts and calls for over three centuries. … The agitators of that day, so history relates, held that they had achieved a brilliant victory In the cause of business morality. St. Louis, Feb. 16.—The Board of Directors of the Merchant' s Exchange held a meeting this afternoon and put the finishing touches on a bill which will be introduced in the Legislature this week, declaring the setting up of a bucket shop or the conducting of a bucket shop business a misdemeanor, punishable by a fine not less than $500 nor more than $1,500. The bucket shop business has thrived and developed rapidly in the city during the past year, and this at the expense of what 18 called legitimate trading on the floor of the Exchange. The bucket shop men have driven commission men into bankruptcy and out of the business, and are now making a red-hot fight for country orders. The regular board resolved to clean them out, and as similar laws are in force in several States they may succeed. The bucket shop keepers are not inactive, and are getting up arguments to show that the only difference between them and the board. Is that the latter is a big bucket shop. The trouble will be transferred to Jefferson City to-morrow. “It looks to me as though we are approaching a crisis. Look at memberships, down to $00. There are the bucket shops. A year or two ago we had them almost wiped out. In pressing the battle the courts went against us. Now the bucket shops are powerful enough to send brokers in on the floor arid control the market whenever they have enough outside traders on their list to make it an object. Just now this question of puts and calls is threatening to disrupture this business. Two months ago, when we had increased elevator charges, B. W. Dunham exploded a bomb In a big meeting by a resolution asking the officials to either enforce their rule against trading in puts and calls or else throw the thing wide upon so that all might do business that way. Stringent Laws Recently Enacted and Local Board's Campaign Are Driving Them Out of Existence. PLTTSBURG, Aug 23.—Chief of County Detectives George H. Waggoner said this afternoon that he would tomorrow raid every bucket-shop in Pittsburg that is open in defiance of the recently passed Mesta Anti-bucket-shop bill. There are scores of brokers' offices in the city which Waggoner declares are bucket-shops, and all of them, big and little, will be treated alike, he says. There is consternation among the brokers here to-night in consequence of the threat of Waggoner. Waggoner classes the bucket-shops just the same as poker or faro rooms. Prisoners Taken Here and in Philadelphia, Baltimore, and Washington Others Indicted. Richard Preusser, Slayer of Myles McDonnell, Also in the Government Net. In Violation of Bucket Shop Law of 1909—All Released on $5,000 Bail of Hearings. For the first time that anyone can remember the Government of the United States has begun in earnest a campaign against bucket shops. As a result of preparations secretly made for ten weeks past by Attorney General Vickersharn, simultaneous raids were made at the stroke of 11 o' clock yesterday morning In four of the largest cities of the East on the offices of what are alleged to be the three largest bucket shop concerns in the country. The Secret Service men had warrants for the arrest of twenty-nine brokers and one telegraph operator, some or which were not served. The evidence as to the character of the firms was collected in part by wire tapping. Unknown to them or to the telegraph companies agents of the Government have been persistently tapping the wires leased by the companies. Of these there are a great quantity, it being estimated that the Boggs Company has been paying $100,000 a year to the Western Union Telegraph Company for them, and the others nearly as much. By finding out the messages which passed between the head offices of the companies and the Consolidated Philadelphia Exchange the United States authorities gathered what they consider to be conclusive evidence that the purchases made by the customers of these concerns were never executed. One of the agents of the Department, of Justice who has had much to do with the working up of the case told yesterday of what the Government has discovered of the method used by the defendants. When the alleged bucket shops opened up the first thing they did was to establish relations with a stock broking firm which had a real membership in one of the two big New York stock exchanges. From it they received bona fide quotations and could also buy quickly any stock which their own customers were supposed to have purchased and on the delivery of which they insisted. Then they installed in their offices a regulation ticker and also a fast wire from their friends, the legitimate brokers. The trading, the Government believes, was regulated by the quotations set up on the board in the customers' room, but these were received over the ticker and came in slowly. The men in charge had their own information over the fast wire fifteen minutes ahead of the customers. In this way they could determine what transactions they would handle. If they saw that the market was going in their customer' s favor they, would tell him that they were sorry, but there was no market at the price he bid. If they saw that In a few minutes the customer trading as he did on a 2 percent margin would he wiped out they would take orders as fast as he could give them. Ostensibly on every order thus received the firm would have to borrow from a bank the 98 percent of the market price, which the customer did not put up, as any reputable brokerage firm doing a margin business would do. It Is asserted, however, that they did not intend to ever buy the stork thus ordered and dispensed with raising the capital, but did not neglect to charge interest for it. Consequently, according to this view, they were making a handsome profit by pocketing all the margins which their customers were putting up and losing, and by taking unearned payments of interest. … Yet, say the Government officials, these men have not seemed nearly so rushed its their brethren on the large Stock Exchanges. A peaceful quiet reigned over the hall, broken only by the noise of the cards as they were shuffled for a game of pinochle. What trading there was was carried on in conversational tones when a game had been finished, and even the tel- egraph operators found plenty of time to leave their keys and take a hand in the game. If a stranger entered the room the pinochle deck was thrown down, telegraph instruments begin to click, and the brokers loudly shouted across to each other, “Ten Reading for sale” and other orthodox expressions till the stranger retired impressed with the stress of their business. The way the Government explains the peaceful manner in which the brokers on the floor in Philadelphia could deal with such an immense and complicated business is by telling of the organization of the head offices of the alleged bucket shops into the offices of Boggs & Co. and of the Standard Stock and Grain Dealers' Association in Jersey City and of Price & Co. in Baltimore have led leased wires from their branch offices all over the country. There from twenty to eighty telegranh operators have been working as fast as they could during Exchange hours, but of the resuits of their iabors only enough has been left after the heads of the concern have handled them to occupy one single wire between the head office and the Exchange. Before the Exchange opened for the day, the Government alleges, a list of purchasers would be written out and for- warded to Philadelphia. Purely fictitious transactions would afterward be concocted to be placed against these names, and often these would be sent on long after the Exchange was supposed to have closed its doors. Clearing House sheets in all due form would then be filled out so as to give a certain air of legitimacy to the proceedings, but merely a fraction of the business that had really poured into the head offices would be represented. The profits to alleged bucket shops were supposed to have run up to $3,000 to $5,000 a day. This is not the first time that Preusser, who is a one-armed man, has been in trouble. Six years ago lie walked up to the room of Myles B. 2IcDonnell, a gambler, in the Ten Eyck Hotel, Albany, and shot him dead [not your typical broker…]. He was tried in Albany and the jury stood 11 to 1 for conviction. The solitary juror refused to be convinced [bribed?] and the jury was dismissed. McDonnell had been a well-known sporting man, and it was thought that there would he a better chance of getting a conviction with a change of venue. The next trial took place in Oneida County In June, 1906. A defense of insanity was put up and the jury believed in it. Preusser was sent to Matteawan, and in five weeks' time was released as cured. After a short trip abroad Preusser came back and starteG in at stock dealing again. He organized the Manhattan Stock and Grain Dealers' Company, with offices at 77 Montgomery Street, Jersey City. The police raided it on Jan. 30, 1907, and discovered in a waste paper basket a scrap of paper which stated that two of the best-known east side politicians had subscribed $12,500 of its $200,000 capital. It was impossible, however, to prove their connection with the concern, and they strenuously denied it. The news of the raid on Boggs & Co. was received with much pleasure by the legitimate stock brokers of the city. They have long tried to drive out the bucket shops as brining discredit on the big exchanges, but have despaired of being successful. The Cassidy law, passed two years ago, has never yet been put in effectual operation, and they are convinced that their best chance of stamping out these parasites is by action by the Federal authorities. The three concerns now attacked are declared to cover practically all the big bucket shops in the country, and if they are wiped out it is believed that the evil will, fora time at any rate, be abated. Newsday - Long Island, N.Y. In the United States, establishments masquerading as brokerages where speculators supposedly purchased stock on margin were dubbed bucket shops. A speculator might place an order for 100 shares of a $100 stock, which would come to $10,000. He would buy on 10-percent margin, meaning that he would put up $1,000, supposedly borrowing the rest from the broker. But oftentimes the broker would not bother with this. All involved knew that the stock would not be purchased. Rather, the speculator had placed a bet on the shares with the equivalent of a bookie. Many of the bucket shops transacted whatever actual buys and sells they placed at the Consolidated Stock Exchange on lower Broadway. For a while, it was a thriving concern - there were years during which volume at the CSE was larger than that at the New York Stock Exchange, galling because the CSE traded many of the same stocks as the older market. Both the bucket shops and the CSE were killed by state investigations - supported by the NYSE - and by the late 1920s both were no longer there. In 1976, Tuscaloosa News reports about Swindlers invading commodities. WASHINGTON The stock market has operated under the stern eye of the federaL watchdogs ever since the 1929 crash ruined millions 01 small investors UuL today the commodity market is In greater need of watching. For a new breed of swindler has grown up around the commodity exchange. These modern Samuel Insulls are known in the trade as “bucket shop operators” and they are making a killing in commodity options — at the expense, of course, of the unwary investors. A commodity option allows the investor to buy a commodity such as sugar or silver at a set price. He gambles that the price will go up. Then he can make a fortune by unloading his commodity at the higher, future price. The catch-22 is that he can also lose his entire Investment It the price should drop. The bucket system pays off because eight out of 10 buyers lose money on their options. For the rare customers who hit it lucky, the bucket shops make good out of their fabulous profits. In other words, the odds are heavily stacked against the customers. So far, the options trading accounts for only 2.2 percent of the $1.1 trillion in commodity transactions each year. The total take from the sale of options is estimated to be between $200 million and $1 billion. But the commodities option market is growing by leaps and bounds. The early twentieth century was a dark period for derivatives trading as bucket shops were rampant. Bucket shops are small operators in options and securities that typically lure customers into transactions and then flee with the money, setting up shop elsewhere. In 1922 the federal government made its first effort to regulate the futures market with the Grain Futures Act. 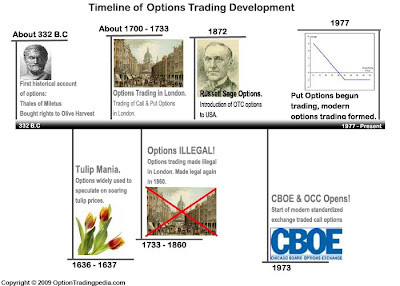 In 1936 options on futures were banned in the United States. All the while options, futures and various derivatives continued to be banned from time to time in other countries. 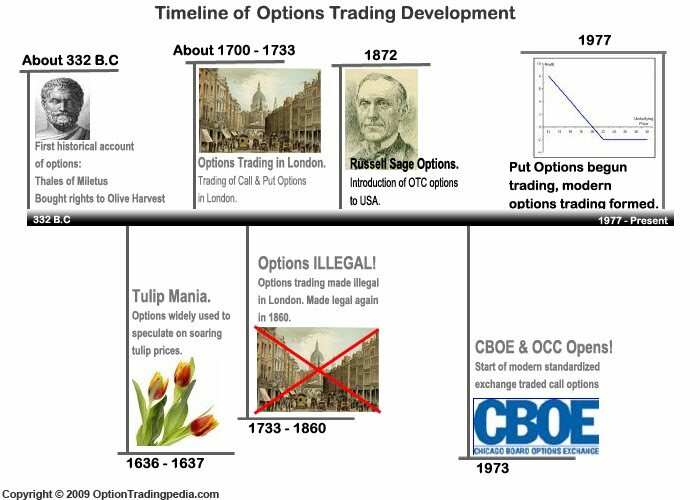 About 100 years following the introduction of options trading to the US market by Russell Sage, the most important event in modern options trading history took place with the formation of the Chicago Board of Exchange (CBOE) and the Options Clearing Corporation (OCC) in 1973. The formation of both institutions truly is a milestone in the history of options trading and have defined how options are traded over a public exchange the way it is traded today. The most important function of the CBOE is in the standardisation of stock options to be publicly traded. Yes, prior to the formation of the CBOE, options were traded over the counter and are highly unstandardized, leading to an illiquid and inefficient options trading market. In order for options to be openly traded, all options contracts need to be standardized with the same terms across the board. That was what the CBOE did for call options back in 1973. For the first time, the general public is able to trade call options under the performance guarantee of the OCC and the liquidity provided by the market maker system. This structure continues to be used today. By 1977, put options were introduced by the CBOE, creating the options trading market that we know today. Since then, more and more exchanges were set up for options trading and better computational models for the pricing of options were introduced. March 5, 2009 — Most people are familiar with the Great Depression, but many don' t realize that this was not the only financial calamity the US went through in the early 1900' s. By the time of the market crash in 1929, the federal government had already made a number of regulatory decisions that were designed to promote market stability. When these didn' t work, the government assumed an even greater role in regulating the economy. What is remarkable about this period is the fact that federal regulations — as many of them as there were — appear to have had much less impact on economic stability than regulations that were imposed at the state level. In fact, it can be argued that state regulatory authority was largely responsible for providing businesses and consumers a stable economic environment for roughly 50 years. But beginning in the 1970' s Congress decided that it would preempt certain state laws, and by the beginning of this decade they had pretty well decimated state authority to regulate businesses in the financial sector. We' re going to take a little time to examine why now is the time to return to a period of state' s rights and limited federal regulation. To understand how preemption of state' s rights undermined the US economy, you don' t have to look far. A great example comes from state Bucket Shop laws. If you have never heard of a bucket shop, don' t feel left out. Bucket shops sprang up all around the country in the late 1800' s. They were essentially betting parlors that allowed you to bet on stock prices. You could walk into a bucket shop and place a bet that a particular stock would go up or down without every buying the stock. By 1929, bucket shops were illegal in virtually every state in the country. The states had outlawed them for two reasons. One was that bucket shops could buy or sell large blocks of stock and manipulate stock prices. This meant that if a lot of their clients were betting on a stock going up in price, they could sell a large block of stock in that company. This would cause the stock price to fall and allow them to keep all of their investors' money. In other words, they were fraudsters. They could do the same thing if investors were betting a stock would fall in price. What the bucket shops were selling are what we commonly refer to as derivatives. Another phrase for them is Credit Default Swaps — just like the mortgage credit default swaps that started the market meltdown last year. These are the worthless securities that have caused banks to go broke, and made the US government the largest stockholder in AIG. So how is that even though bucket shops are against the law in most states that companies like AIG were able to sell Credit Default Swaps? The answer is one simple word. Congress. But that was not enough for Congress. They wanted to make sure that everyone understood their intent. So they also added language that amended the Securities and Exchange Acts of 1933 and 1934 to make sure that the definition of a “security” didn' t include “credit default swaps” or certain other swap agreements, and they forbid the SEC from any such regulation. With the stroke of a pen, President Clinton and Congress used their regulatory authority to completely deregulate a large market. In fact, it was a market that had been considered so important to financial stability that a century earlier it had been regulated out of existence entirely. Ahh, but those who don' t study history are doomed to repeat it! Had Congress simply allowed the states to continue to regulate this area of the market, it' s a fairly safe bet that the economy would still be humming along quite nicely. I saw another wonderful piece of "balanced journalism" on CBS' 60 Minutes last Sunday. You know 60 Minutes - the television news program that epitomizes the principle of fairness, especially towards conservatives and businessmen - right? The piece that caught my eye was one comparing certain types of investing, specifically hedging with derivative investments, to casino gambling and bookmaking. More specifically, CBS correspondent Steve Kroft was up in arms about a type of derivative investment called credit default swaps, which the program defined as (quoting from the 60 Minutes website transcript), "essentially side bets on the performance of the U.S. mortgage markets and some of the biggest financial institutions in the world - a form of legalized gambling that allows you to wager on financial outcomes without ever having to actually buy the stocks and bonds and mortgages." This is, at best, a half-truth, and it maligns a whole industry based on the mistakes of a few investors. Hi Eric, could you please move the right hand side bar further to the right? It's obscuring the article text in both firefox and google chrome and it makes it impossible to read the last word on each line. Second the comment on the layout I also can't read the text properly.